When painting a guitar, preparation is critical to success. At every stage, it’s important that you get the body as smooth as you can. A bit of work early on saves a lot of work later. Open-pored woods such as ash must be grain filled before lacquer is applied otherwise the lacquer will sink into the grain and it will be very difficult and expensive in lacquer to get a smooth finish. Grain filler is not the same wood filler and is only for filling pores in the wood so before you start, sand the wood thoroughly to 240 grit or so to remove any scratches and minor imperfections. Bigger imperfections such as holes will need to be filled with wood filler which may mean that a solid colour is your only option. 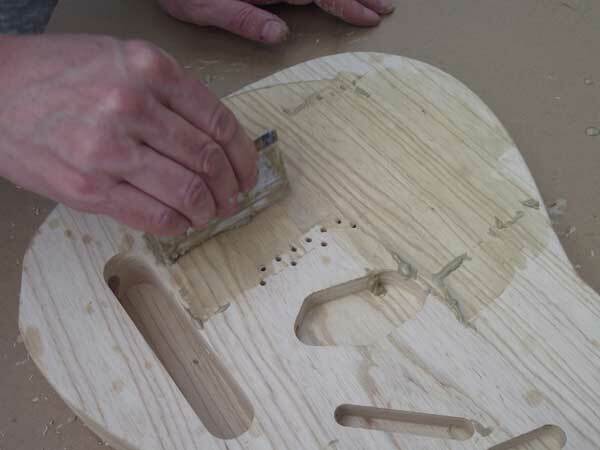 Once you have your guitar body sanded you can apply the grain filler. Here, I’m using Rustin’s natural colour grain filler. This works best when thinned to the consistency of double cream so my first step it to do that. You’ll find that the wood naturally absorbs the solvent so you’ll need to keep adding more in order to keep the correct consistency. Apply the filler with a squeegee, cloth or your fingers, whichever works best for you, but be sure to pack the filler deep into the wood’s pores. Here I’m using an old credit card. Work along the grain to be sure that the filler is pushed into the pores. Don’t forget to treat the edges too, as well as inside the cutaways. It’s easy to neglect these areas! Because the oil-based filler dries slowly, working quickly it’s possible to fill a reasonable area before scraping off the excess. Here, I’ve filled about half the body. Again, you can use the implement of your choice but here I am using my trusty credit card to remove excess filler. I’m scraping across the grain so that I don’t pull the filler out of the pores. The more you scrape off at this stage, the less sanding you need to do to remove dried on filler. I find it best to wait an hour or so, when the filler is hard in the pores but still fairly soft on the surface to scrape. 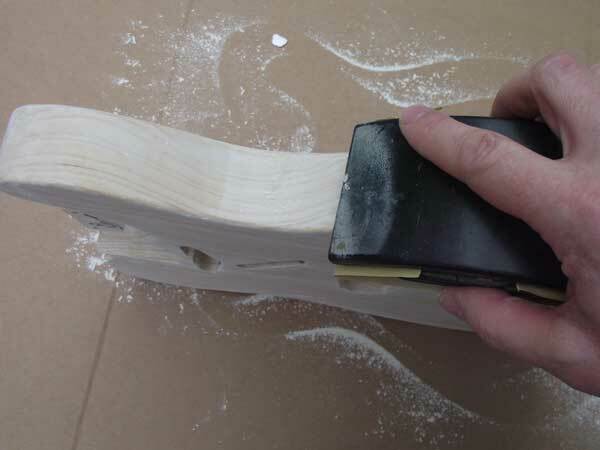 Once you have removed most of the excess filler, you need to leave it to dry over night before sanding. Sand carefully to 320 grit, using a block and going along the grain so as not to introduce any scratches. You need to get down to the surface of the wood without sanding out the filler that you’ve so just applied. Sand the edges carefully too and then inspect your work to make sure you’ve done a thorough job. If you have missed any areas, you’ll need to apply more filler to them. It really is worth the effort of getting this stage right as everything else depends on having a smooth surface for your lacquer. You said no finish, but after you have grain filled I’d reccomend at least one coat of matt poly. Just one coat and matt will still look unfinished but will add a lot of neccessary protection. P.s. Thank you for these great instructions. Firstly I’d like to thank Steve for the fast dispatch of the stuff I ordered from him! Secondly, I’m curious as to whether an initial sanding sealer coat prior to grain filling would be any help to the process at all? I seem to be getting the impression from looking at the ash body I have that the sealer may fill some of the smaller pores first, leaving the larger areas of grain for the filler to deal with. I could be completely wrong (this will be my first attempt at a semi-transparent finish) so any advice/input would be greatly appreciated. I generally fill bare wood and then seal over that. Some people spray a coat of sanding sealer before grain filling which I think helps prevent the solvent in the filler soaking into the wood. At what point would you add the sealer – immediately after filler or wait to dry? The grain filler needs to be hard, dry and sanded smooth before you apply the sealer coats. Don’t start the sealer until you are sure you’ve filled every pore! Some people do. I think it’s to stop the solvent in the grain filler soaking in. Not something I do. You do need to grain fill thoroughly as if not, as I say, you’ll get pinholes in your sanding sealer. I sell this sanding sealer for the purpose. I’d recommend 1 sanding sealer, 1 butterscotch and 2 clear gloss. I grain fill then dye. The Rustins grain filler that I use takes stain well. At least it does those I have tried. As always, if you are doing anything for the first time, test your techniques on scrap wood. Water-based dye will raise the grain more. I always use a spirit-based stain. Hi steve would i put the dye on before the sealer or after? If you are going to stain the body then it’s best done after grain filling as the filling and sanding process will affect the dye. Rustins filler takes stain very well, pity it’s hard to get hold of at the moment! Thanks steve yes I tried a good few local shops for grain filler, with no luck, so I bought some rustings off the internet a while ago. could I just ask, is it imperative i use sanding sealer after the die?. And in your opinion what is the best finish nitrocellulose clear or an oil finish on a died body.. im doing a white translucent on an ash body.. thank your dor you time.. 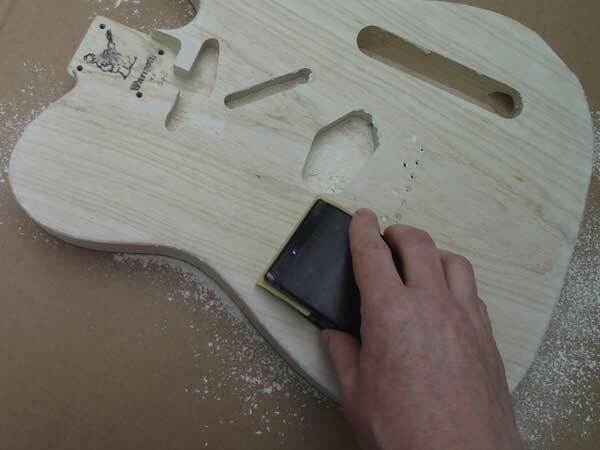 If you are doing a white transparent finish (what Fender calls White Blond) then I don’t know why you’d be dyeing the wood, which you’d want its natural colour. I sell a white blond lacquer in my shop. Ok yes thanks for that. Yes i can see the instructions, i understand… ive seen people do it with other colours but not white.. i have to say Tonys sunburst looks incredible.. I want to use tru oil on a sapele body then use a matt lacquer. Would i use this process before or after the tru oil? Hi James, I don’t understand why you’d use Tru-Oil as well as lacquer. Using different media just risks potential incompatibilities. If you want a smooth matt finish, I’d grain fill, seal and follow with the matt lacquer. There are tips for satin lacquer in my FAQs which apply equally to matt lacquer. i’ve read online that tru oil can be used in conjunction with lacquer, i just don’t know which way to go because the sapele i have is a beautiful piece of wood and i don’t want to ruin it by covering it up too much (if you know what i mean). So you would use satin lacquer? how would you finish it off? would it need wet/dry sanding then polishing up? Tru-OIl can be used in conjunction with lacquer, but I just don’t know what the benefit would be. If you want a matt finish (or at least very low gloss) then I sell a matt lacquer. As I said, there are tips for non-glossy finishes in the FAQs. First let me say your articles are excellent and full of great info!! In your article there is a picture of ” Bartoline Premium Low Odor White Spirit”. Being from the U.S. I’m not familiar with this product. At first I thought it might be what we call Vinegar but I’m not sure. Would you please give me more info when you have the time. White spirit is known in the USA as naphtha. It’s a petroleum distillate used for thinning paint, cleaning brushes and so on. I was sanding down the filler last night with 320 grit as you said here. Sandpaper kept clogging up very quickly. Maybe I didn’t scrape off enough excess. Used 2 sheets of 320 to get the tele body done. Could have done with a bit more but that’s all I had left from my amp build. Or maybe quality of sandpaper wasn’t the best(Klingspor). What paper do you use and how much of it to sand down the body after grain filling? I always use 3M “Sandblaster” which resists clogging and is very consistent in grit. I generally use 2/3 of a sheet. Chances are, as you say, you left too much filler on the surface. The problem with this is that you need to sand so much to remove it you risk opening up the grain again. Thanks very much Steve. I thought of getting some M3 as I read in various websites that that’s the real deal, but had a go with what I had on hand. I think it’s good to go on with the sealer now but it might be worth to have a go with grain filler again and get some M3, just the be absolutely sure. Thank you ever so much for your input on all these subjects and sharing your knowledge. Great advice on your page! I’ve recently begun a refinishing project of a fender p-bass from ’98. It took forever to get rid of all the polyester, but it’s finally gone now! However, as a result of these difficulties, there are a few ‘dents’ or ‘holes’ in the body now. No really big ones – around 0,5cm. all of them. I’m holding back on the finishing though, because I can’t figure out how I should mend those marks. Is it enogh to get a grainfiller for such small holes, or should I use a wood-filler for everything that isn’t classical ‘grains’?, and if so, what makes do you recommend for a body that is to be finished with a nitrocellulose laquer? (I’ve heard that some of them don’t look too good under there after a while). And two last things: do I sand before the application of grain-filler, and then again, or do I wait? And: how many spray-cans of nitrocellulose do I need for a refinishing in red? I use a 2-pack wood filler, such as Ronseal High Performance wood filler. See this blog post on preparation. Sand before grain filler to get everything flat, then afterwards to remove any filler remaining on the surface. You probably need one can each of sanding sealer, primer and colour, and two cans of clear. I’m starting a Telecaster project, alder body already purchased. I’ve read online that with alder there’s no need to grain fill prior to sealing/priming/painting due to the tight nature of Alder’s grain. Looking at the body I have it does look pretty tight, but I’m not sure if some gaps may become apparent when the paint is applied. Would value your opinion – still worth grain filling? Hi Alistair, I can confirm that you don’t need grain filler on alder. You do need to get it good and smooth however and that’s why you should use sanding sealer. Please see this post on using sanding sealer to prepare for a lacquer finish. As I say in the post, alder will soak up a lot of sealer to be sure to apply enough at the end grain. I am just about to embark on a strat build. I have bought a unfinished body of swamp ash with a really nice grain pattern. I want to enhance the grain before a light honey strain and then clear top coat. How can I enhance the grain ?? The best way is probably to use a coloured grain filler. You can control how much you emphasise the grain by the colour you use – a black filler will be most dramatic. As always when using an unfamiliar technique it’s best to practice on scrap first. Hello Steve I wondered if you could help? I have a ’78 tele that I intend to restore but some idiot has coated the neck in some kind of honey like lacquer. Is there a way that I can remove this and try to get the neck down to it original lacquer without taking of my original ”fender’ decal etc?? Any advise would be a massive help ? You should be able to use a paint stripper which won’t touch the polyurethane finish on the neck. But do test anything you use on the heel first where a mistake won’t be seen. I think that by 78 Fender had stopped using nitrocellulose on the headstock face too, but exercise caution – it might be best to block sand the headstock face just in case. I think that once you’ve removed the varnish you might find out why it was applied in the first place. The original finish might be badly damaged. Did you manage to preserve the transfer? I don’t sell wipe-on polyurethane and I don’t think that it would give a period correct finish either. The only way to replicate the original finish is 2-pack cured polyurethane but it’s not a DIY proposition. The closest you can do at home is to use 2K aerosols but nitrocellulose is easier to handle. I managed to preserve 99% of the transfer.! I’m thinking about using Tru oil now!!! Would this be OK to use with the grain filler you’ve suggested?? You don’t need any grain filler with maple which is a very tight-grained wood. I mean the body which is ash ??? I’ve got a swamp ash tele body on order. I want a very natural look. I plan to grain fill then add 2-3 coats of natural danish oil. Danish oil will impart some colour but you’ll need more than 2-3 coats I think as it builds slowly. When I oiled my oak kitchen worktops I applied about 10 coats and even then it only just about sealed the wood. I have a white ash body. Can I grain fill it, then Tru-Oil it and then finish it off with gunstock wax? This is my first go at finishing a body. You can but it’s not the sort of thing that I’d want to encourage! I’m curious about the grain fill/Tru-Oil/gunstock wax process. What part of it would be the issue? You’ll have to excuse my ignorance. I’m a novice. I’ll be using the same grain filler on my ash guitar body. Just curious as it’s quite tricky to find info online. Can I stain the body after I have grain filled? I know that I can mix stain in with the filler but I really would like to know if I can apply the stain after I have filled the grain? I have got some colortone stain. Fill the grain with Rustins. Sanding seal with the spray that I’ve seen on your website. Sand back so it’s level. Finally thin layers of tru oil. Do you think this process sounds like it could work? Thanks, any light you can shed will be greatly appreciated. Thanks, yes the Rustins grain filler takes stain well. I’m not so sure about Tru-oil over sanding sealer though. The oil is designed to penetrate bare wood so wouldn’t be appropriate over the sealer. Much better to finish with a gloss or satin lacquer. Thanks so much for your response. It’s really appreciated. It’s hard to find accurate info about this online. Do you think it would work if I just didn’t use sanding sealer and went straight to the tru oil stage? That I don’t know. I’ve never used Tru-oil as a finish. I’m only using tru oil as I’m short on funds, can’t use sprays at home and it’s all I have. I’ve read a lot of your articles and your work is great. Keep up the great work. Hi – do you find the ‘natural’ grain filler dries ‘light’ in the Ash grain causing it to look like grain filler…or, is it sufficiently translucent to remain dark looking? It does dry light as you can see from the dust in the photos above. Lacquer darkens it slightly. You do need to grain fill ash and I’ve never had any joy with clear water-based fillers. Yes adding a dye will stain the wood. I use an umber pigment here https://www.manchesterguitartech.co.uk/2017/09/03/spraying-a-les-paul-junior-vintage-sunburst/ but if you want a very dark filler you could try adding lamp black. Im doing my first build and nitro paint job, so having to go slowly and research each step. Can I use Ronseal Wood Filler for the grain filling? It looks much the same as the Rustins type, but was available near to home so I went for that. Grain filler is not the same wood filler, which is for filling larger holes. 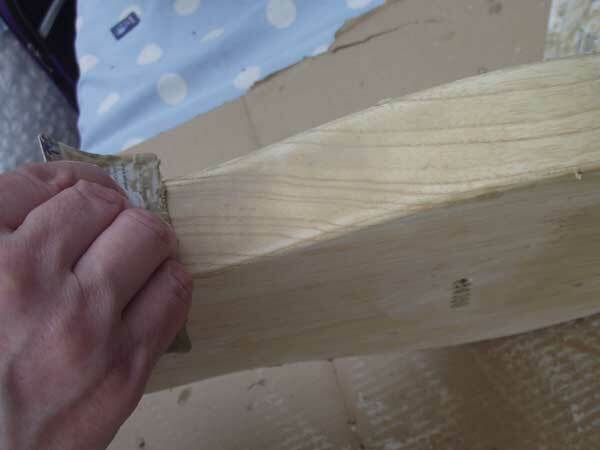 It may work to a degree though, but beware that Ronseal make a few types of wood filler, water-based (which will shrink and expose grain again) and a catalysed polyester “high performance” version which has a very short open time. I’d recommend you use the right product for the job. Hey Stephen thank you so much for providing all of the information you do. This is a great article and I will be referencing it as I start to finish my Swamp Ash bass body. I do have a two-fold question for you if you are inclined. My plan is a Shell Pink finish that is relic’d. 1. Since I plan to relic the finish, do you recommend no clear coat for the final stage or should I go with a matte or satin clear? Also, if a clear is recommended should it be applied after the relic’ing is applied or beforehand (probably more authentic)? I would always finish the guitar properly with a clear gloss topcoat before distressing the finish. A clear gloss finish is most brittle and will craze better than one containing non-lacquer solids (pigment or matting agent) that make the finish softer. There is a couple of links on my FAQ page that show some aging techniques, including an excellent article from Guitar Magazine which uses my lacquer. Great resource! Was wondering if the process would be the same for filling an alder body? I have an unfinished telecaster body made from alder lying around and I’d love to grain fill it. Thank you. There is generally no need for grain filler on alder as the wood is much tighter grained than ash. Just go with plenty of sanding sealer as here. Hi Steve, great video, thankyou for taking the time to make it! I’ve got a Swamp Ash Tele body and I’m hoping to do a ceruse type finish but with a Artic white body and dark grain. I was thinking I’d spray the body white nitro before grain filling, then fill the grain with coloured grain filler, then laquer. 1.Do you think this will work? 2.Will your rustin’s grain filler work over nitro paint (as opposed to under)? 4.Also I have some little splits in the wood, would it be best to grain fill these before spraying? Yes that plan would work. It’s just like the TV Yellow job I did here. You could experiment with the dye on some scrap but I don’t think that it would work. I wouldn’t use dye at all in fact as it risks staining the white, I darkened the filler with some artists umber pigment which is insoluble so will not stain. As for the splits you need to stabilise those, which grain filler will not do. You should get some glue in there and wood splints if they are wide enough. I’d still be a bit concerned about the splits though and probably choose a different body. So (looking at your example) should I use white primer base before white nitro top coat? Also will I need to seal it at some point? Having said all that I’ve just noticed you sell Opaque White Blond Nitro Aerosol which was my original plan but I couldn’t find anyone that sold it (until now). In the colour picture is the yellower colour an example of how it will age? 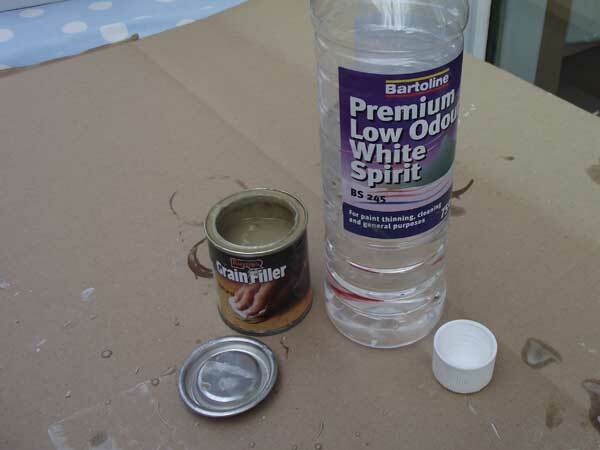 If you are filling the grain then yes you can use primer as a base coat as I did. There is an example of White Blond here. The right hand side of the swatch shows the colour with a tint over the top (mimicking aging) as I have done the the example I linked. Ok great, so following your white blonde example (I’m leaning more towards this now), would using your mahogany grain filler bring the grain out more than the neutral grain filler? Also I’ve read about using a wire brush to open up the grain (tho that may just be for doing ceruse finish), do you have any thoughts? I use the neutral colour on ash, the grain still shows though fine. The mahogany filler is orangey and wouldn’t be suitable at all. If you want a dark filler, mixing a dark pigment in the neutral filler works but it needs to be something that won’t stain the wood. And I wouldn’t use a wire brush – no need and you risk creating unsightly scratches I think. Great thanks so much Steve! Hi guys, bit of a rookie at this finishing work. I bought a genuine Fender reject ash Tele body which is needing scratches and holes filled prior to rubbing down. The wee termites (wood-worm) had got to the body too – mainly on edgings so there are a trillion tiny holes to fill up. I’m obviously aware of having to make sure the holes are properly filled to prevent imperfections appearing on the final job. 1) Any suggestions on the best material to fill the holes? 2) After filling the wood-worm holes would the same product be ok to fill some scratched and imperfections on the main body? 3) I’m also aware I may HAVE to make the final finish a solid colour (I would have liked natural or honey blonde or Butterscotch) due to the termite holes. I’m building a bass with my son and as it’s got an ash body I was going to use the Rustins grain filler as mentioned in your posts. Problem is it is near on impossible to purchase due to the Rustins warehouse fire so wondered if you could recommend an alternative? There are some places selling it, but £36 for a £4ish tin is not an option. You could try Tonetech Luthier Supplies who have some similar products. I need to grain fill and laquer the rosewood back and sides on a newly built acoustic guitar. If I use the Rustins mahogany grain filler, how do I prevent it from staining the white purfling lines and brown and white back stripe? The Rustins mahogany grain filler is not the right colour for rosewood. I’d suggest using a clear epoxy grain filler or a black filler such as Jecofil. It won’t stain plastic binding and you can mask off any wood binding you don’t want the filler to affect. Hi Steve, how do you tell that you’ve sanded down to bare wood again after putting the grain filler in? When I first scraped it off and let it dry there was a slight whitish film on the surface that I’ve since sanded off but the sawdust still looks very white. Will this destroy the finish? 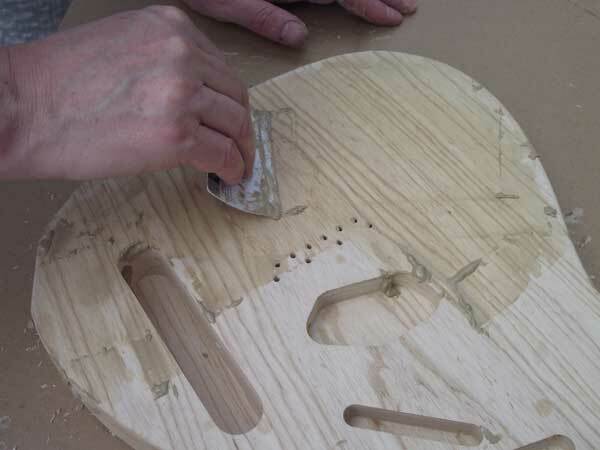 As long as you’ve removed the filler from the surface and your guitar body feels silky smooth you should be fine!